The co-founder of Microsoft and heavyweight philanthropist says he reads around 50 books each year, or the equivalent of one per week for those keeping score at home. On occasion, a book is so good that Mr. Gates will recommend it on his popular blog, Gates Notes. Over the years, there have been nearly 190 such recommendations on his blog, with underlying themes such as how things work and the quirks of human nature. Today’s visualization below breaks down over 150 of Gates’ nonfiction recommendations by plotting each book based on review scores from GoodReads, one of the world’s most popular sites for book reviews. Meanwhile, the bubbles are sized based on the number of reviews, giving an approximation of the book’s overall popularity. As an avid reader and influential person, Gates’ book recommendations hold a lot of weight, so it’s worth taking a closer look at the list. When between scientific tomes and tennis player autobiographies, Bill Gates reads the bestsellers just like everyone else. 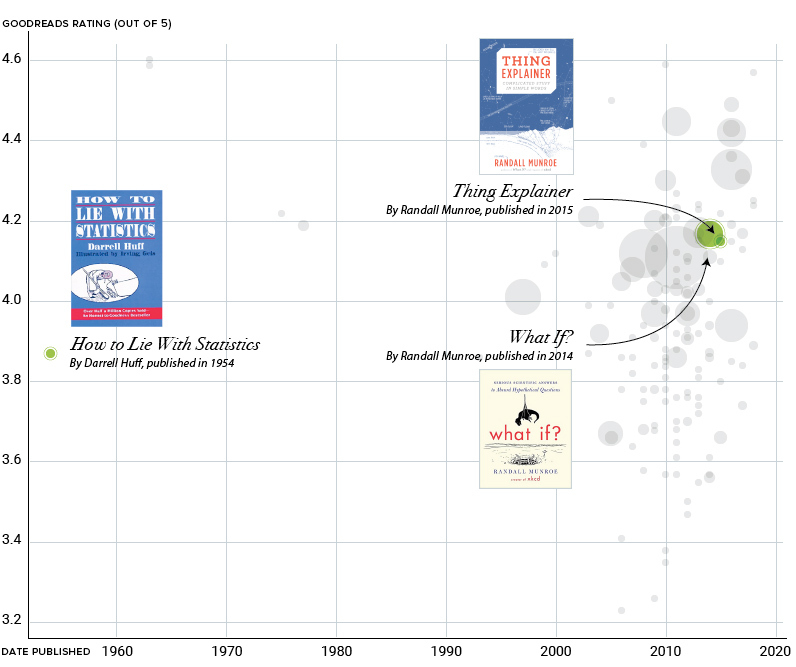 More prominent circles on our visualization include now iconic books such as Guns, Germs, and Steel by Jared Diamond, and Steve Jobs, the biography written by Walter Isaacson. There’s something comforting in the fact that one of the world’s richest people is gaining insight from the same book you can borrow from the library for free. There’s no billionaire version of Enlightenment Now. While Bill Gates has recommended some hugely successful books, he’s also not afraid to introduce his audience to niche selections. A prime example of this is the long list of books by Czech-Canadian scientist and policy analyst, Vaclav Smil. A prolific author, Smil has published dozens of books over his distinguished career that cover topics ranging from global energy to whether humans should be eating meat. I wait for new Smil books the way some people wait for the next Star Wars movie. Within the long list of books with a conventional format are a few titles that have a decidedly more visual component. Interestingly, they come from books published over a half-century apart. The first example is How to Lie with Statistics by Darrell Huff and illustrated by Irving Geis. This unique book is full of inventive illustrations that help demonstrate concepts that would be cumbersome to explain in text form. In the age of fake news, How to Lie with Statistics has seen renewed popularity, with come help from Bill Gates’ recommendation. Next, are two books published by Randall Munroe of XKCD fame. These books embrace a more diagrammatic approach to explaining complex concepts in Munroe’s quirky style. Based on the popularity of Gates’ recent 5 Books Worth Reading This Summer post, it’s safe to say this body of recommendations will continue to grow. In case you missed it: Visual Capitalist recently published a book called Visualizing Change. Correction: One of the graphics in this post previously listed the book Hillbilly Elegy as “Hillbilly Eulogy”. We regret the error.